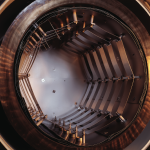 T-M Vacuum Super Series vacuum furnaces are the high vacuums – high-temperature, technically advanced vacuum furnaces to satisfy all of your heat-treating needs. 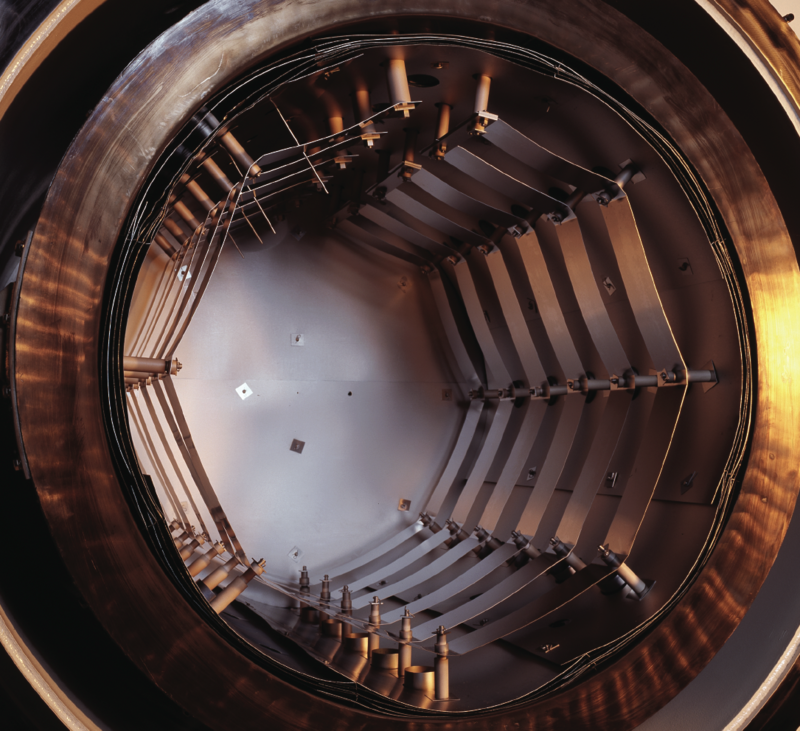 There is a two cubic work zone within the all- stainless steel chamber of these vacuum furnaces that are capable of holding up to 200 pounds of material. 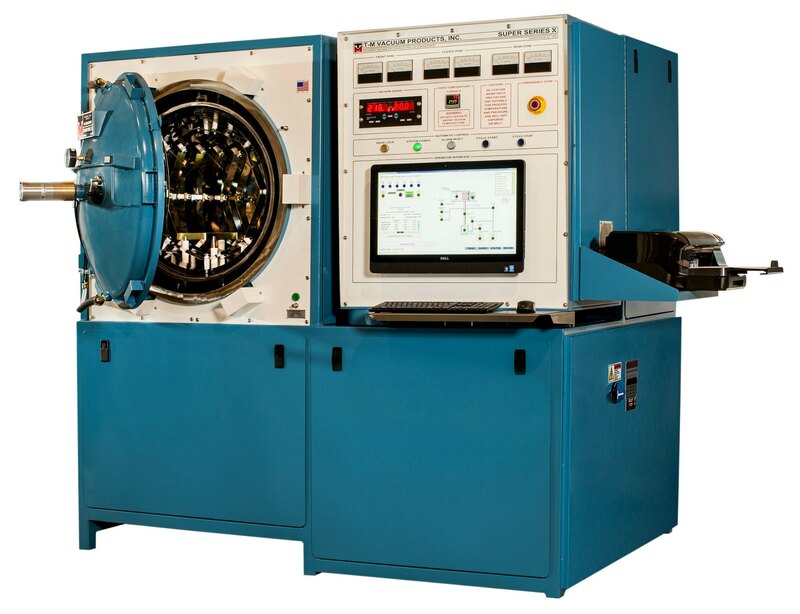 This capability makes these vacuum furnaces perfect for brazing, sintering, tempering, austenitizing, hardening, stress relieving, bonding, annealing, and many other custom vacuum processes. A precision heating environment is created with the standard three-zone heat control package and electro-pneumatically operated Heat Pack door shield assembly allowing for perfect temperature uniformity of heat treating materials. The vacuum furnaces have a specially designed Hot Zone-to-chamber ratio which enables the high-speed pumping system to reach high vacuum quicker, maximizing productivity and providing quality with a cleaner work zone. The vacuum furnaces have inert gas on board Quick Cool System, where the metallurgical gas quench decreases your cycle times by rapidly cooling the chamber and increasing your product output. The Super Series HMI software system can be configured with our controlled cooling, which allows the user to precisely control the cooling environment of the vacuum furnaces. The Super Series vacuum furnaces can also be configured to accept multiple process gases. Once you have determined your specific heat treating process parameters, the computerized control system takes over to completely automate the process and archive all system data. An operator needs only to load and unload the chamber and press the start button of the vacuum furnaces to proceed with the heat treating process. The Super Series systems are completely contained vacuum furnaces that contain no exposed wires, cables or pumps. This feature makes these vacuum furnaces very easy to maintain, as well as provides you with clean units and saves valuable factory floor space. Installation of these vacuum furnaces is as simple as connecting the unit to electric service and attaching gas, water and air lines. The Hot Zone is fully removable for service. If the Super Series work zone is not large enough for your heat treating application, please ask about our PACER Series Vacuum Furnaces. Among the various sizes and styles of vacuum furnaces we carry, we are sure to have the right brazing, tempering, high or sintering vacuum furnaces to suit your heat treating applications. Super Series Control Panel; Click to enlarge. 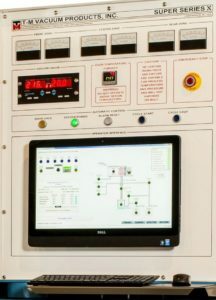 The system has state-of-the-art full computer control as standard, enabling automatic control of all system functions. System operation is defined by user created recipes which are stored on the system. More than 30 user friendly screens display all set points and operating data. Process parameter can be accessed and stored on the system in real time for historical reference or as customer required documentation. Operating parameters are displayed on the system’s 23″ flat panel touch screen for the operator’s ready reference. Full data logging with print capability out is standard. All T-M Vacuum Products, Inc. products are equipped with standard safety features to ensure safe operation, including all vacuum furnaces and other heat treating equipment. Please consult T-M Vacuum Products, Inc. at (856) 829-2000 for availability and pricing of these or any other option requirements. *All times and pressures are for clean, dry, empty, out-gassed furnace, starting from ambient pressure and temperature, and may vary. Times and pressures subject to pump size and maximum temperature.